Home » Baseline: Our Blog » Press Releases » What does your data centre do for you? What does your data centre do for you? Expanding your technology footprint may not be your highest priority for businesses but in today’s competitive business landscape, where data is core to your existence, all organisations need to better protect their data and in turn their #data centre. Think about a police department or police station as an example, an institution that needs its data stored in a secure and as close to a disaster-proof environment as possible, but may not have the funding for the necessary IT skills to create one. Or they are sticking to legacy equipment because they don’t have the technical resource available at their disposal to support and roll out new tech. What can they use to deploy technology in their business, ensure that these assets are secured, and that they can be remotely administered if needed? Its here we suggest that departments and companies who find themselves in this type of situation, opt for a solution that is self-contained, mobile and that enables them to rapidly and instantly wheel-in, plug and go, an entire IT infrastructure that can be managed from a #single IP address in minutes. Remember that building a data centre can be an enormously costly exercise. Not just building the physical infrastructure, but then also ensuring it has the right environmental controls such as air-conditioning, access control, fire detection systems etc. Building a compliant and resilient environment takes time and it costs money. With a mobile and built for purpose unit, all services, including access to the data centre, who accesses it and when; emergency notifications and environmental monitoring for environmental factors such as fire and floods; can be remotely managed from a smart device. 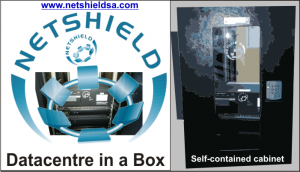 A device that is self-contained immediately eliminates the need for costly construction of data centres, and allows you take advantage of benefits associated to the distribution and deployment of remote centres. With a “mobile” unit, you can literally wheel it in, bolt it down and start working straight away. This makes a unit of this nature the perfect data centre solution for new businesses that need a data centre that will enable staff to start working instantly, but that has all the benefits of a physical room and negates the need to invest in scarce technical skills or waste time on hours of configuration. It’s the perfect solution for knock up and knock down sites – particularly in construction. Why does self-contained matter? A unit that is self-contained is built with all the applicable services as would be installed in an actual data centre. It is also tamper-proof – meaning those who shouldn’t access it – simply can’t. To further expand on protecting your environment, don’t accept anything less than a solution that can be fitted with an air conditioner, environmental manager, #power management (PDU’s included) and sensors such as temperature sensors, humidity sensors, water detection, smoke detectors, fire extinguishers and access control (keypad, RFID, biometric). The key with all of this is early detection, prevention where needed and ultimately robust security. In my mind the most compelling reason to have a system in self-contained unit is the control it gives you. Make sure that you can control all of your services from a single IP address that you can dictate and assign to devices of your choosing. My preferred method for this is 24/7 #remote monitoring and configuration through onboard SNMP as well as backup emergency reporting and remote SMS control. So no matter where you are, you will have control over your data. Notifications are also critical, as are reports on the behaviour of your data centre. You must ensure that you are aware of what your system is doing every step of the way, especially since it is in a remote location and not “right under your nose” as it were. So make sure that whatever solution you select is able to produce and send email report summaries of user definable statistical events. Form factor is also important. A smaller more mobile data centre immediately requires less space. By putting your data centre in a box – you can take control of your data and your IT environment, avoid unnecessary infrastructure costs, negate the need for unnecessary technical resources and most importantly you take back control of your infrastructure. So no matter if your business or government department is made up of multiple branches, remote locations, or simply temporary sites – don’t start breaking ground to build foundations – consider something that is self-contained, mobile and comes in a box. Press Releases Tags: data centre, Power management, remote monitoring, Self contained Cabinet, Server room, single IP address, surge and lightening protection planning. Bookmark the permalink.